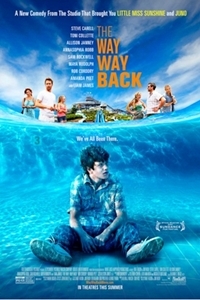 THE WAY, WAY BACK is the funny and poignant coming of age story of 14-year-old Duncan's summer vacation with his mother, Pam, her overbearing boyfriend, Trent, and his daughter, Steph. Having a rough time fitting in, the introverted Duncan finds an unexpected friend in gregarious Owen, manager of the Water Wizz water park. Through his funny, clandestine friendship with Owen, Duncan slowly opens up to and begins to finally find his place in the world - all during a summer he will never forget.